The memoirs of David Martin. In my eightieth year, 2009, I was working with my friend Otto Kallscheuer for the European Commission, and he asked me how I became a sociologist. 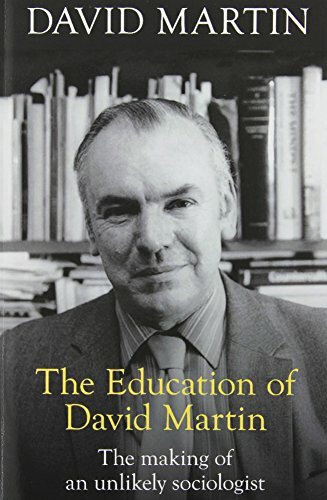 I explained that in 1947 I had been refused university entrance to study English Literature and failed a scholarship to the Royal Academy of Music. I had spent 1952 to 1959 as a primary school teacher in West London and Somerset. I stumbled on sociology by accident when a colleague in the Somerset school showed me his correspondence course for an external London University degree. From 1956, when my first marriage broke up, to 1959, I followed that course in my spare time. To my astonishment I won the annual university scholarship in sociology and entered university as a postgraduate. Between 1959 and 1971, as I moved from primary school teaching in SW14 to an LSE chair, I was besieged by neurasthenia and a chronic fear I was an interloper with no right of entry. The aftershocks never fully dissipated. Otto thought the story worth telling, though he can have had no idea of the travail of telling it or the re-examination of self it might require.